In Malawi, when asked what trees should be planted as a part of forest landscape restoration (FLR) projects, local stakeholders—predominantly male—suggested trees that provide timber, charcoal, and furniture-making materials commonly used only to provide sources of income. 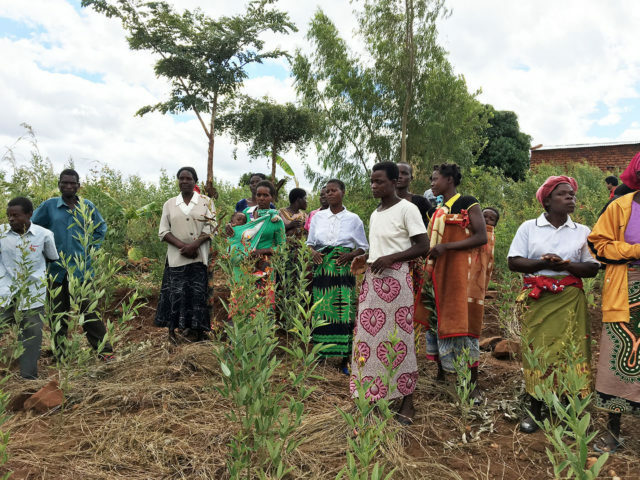 However, in these communities, planting trees and restoring the landscape provides opportunities and benefits for Malawian women that look quite different to those of men’s. Malawi has made a 4.5 billion hectare commitment to the Bonn Challenge – a global effort to bring 150 million hectares of deforested and degraded land into restoration by 2020 and 350 million hectares by 2030. IUCN is working closely with the Government of Malawi to apply the Restoration Opportunities Assessment Methodology (ROAM) to identify which areas are primed for FLR. To advance national goals on gender equity and the empowerment of women and girls, IUCN is helping the Government of Malawi plan restoration interventions through a gender lens. To kickstart the process of a gender-sensitive and gender-responsive ROAM, gender and FLR specialists from IUCN’s Global Gender Office (GGO) and Global Forest and Climate Change Programme (GFCCP) asked women what trees they would like to see planted as a part of an FLR project. The women asked for fruit-bearing and medicinal trees (such as Moringa oleifera, a species valued for its use in combatting malnutrition in infants and nursing mothers, among other traditional medicinal purposes) and their prioritisation of these species highlighted the differentiated interests of men and women. While men prioritised species that provided economic benefits over others, women were focussed on those with the potential to contribute to the food security and health of their communities. In instances like these, it becomes clear that a gender-responsive FLR approach, which engages women and men equitably, not only helps communities regain the ecological functionality of ecosystems but also improves their ability to increase agricultural output, enhance food and nutritional security, generate income, and supply daily needs while bridging gender gaps to address inequality. Developing gender indicators to monitor and evaluate the impact of FLR on the well-being of women, men and youth from the community to the national level. The publication concludes by grounding the methodology within practical examples. It illustrates the process conducted in Malawi, which shares the experience, findings and lessons learned to support additional ROAM and FLR policy, programming and projects. Providing further insight, a roadmap is also laid out as an example, demonstrating how gender considerations can be integrated into REDD+ processes in Uganda. Taken together, the guidelines, the Malawi case study and the excerpt from Uganda’s gender-responsive REDD+ roadmap underscore the need for a gender-responsive FLR process. By investigating economic, social, financial and policy scopes, multiple entry points where women can play specific roles and interventions are identified. In turn, enhancing gender equality will support the shaping of equitable, effective and sustainable restoration opportunities.